If you’ve read the How to Put Together the Ultimate Survival Kit article than you know how I stress the importance of always carrying a survival kit with you (a first-tier kit). This is your fall-back kit — what your left with if all you have is what’s on you right this moment. Could you survive? 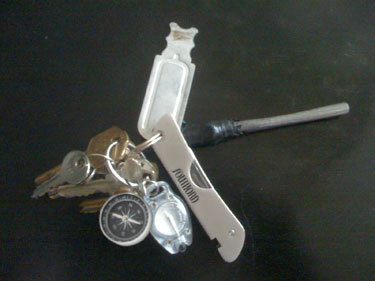 The obvious worry when having all your items on the keychain is losing that keychain. That’s why, if possible, it’s important that you carry the most important items on yourself — either wearing it or having it integrated with your clothing somehow. 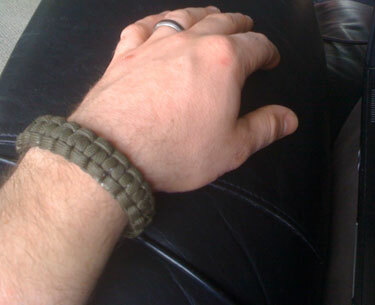 On my wrist, I carry a little over 10 feet of 550 paracord: very strong and very useful cordage that can be used in a multitude of survival situations. 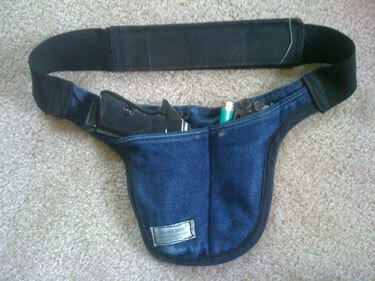 My favorite concealed-carry holster is the SmartCarry. It’s a simple concept, being essentially a pocket that wraps around your waist, is concealed under your pants and is held together with velcro. Pistol – This is typically a Walther PPK (as pictured below) but sometimes I’ll carry my full-size Glock 22 (.40 Cal) depending on what I’m wearing. 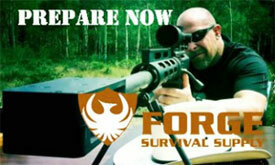 I think everyone should carry some form of personal protection device (knife, mace or gun). Firesteel firestarter – This isn’t a typo. While I do carry one on my keychain, I also have an extra on my self. I’ve mentioned the importance of redundancy. Since fire is such an important survival tool, having multiple ways of creating it is always a plus. Lighter – Again redundancy. The firesteel is more of a long-term fire source, but a lighter is great if you require a quick flame. Leatherman Wave Multi-tool – Multi-tools are great for survival and all-around daily use. Plus it serves as a backup knife for me (again redundancy). 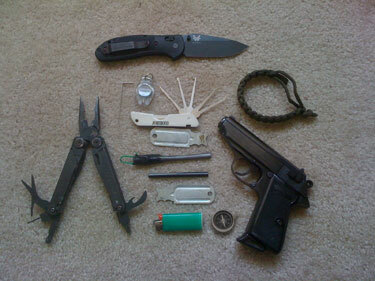 Right now, the only thing I keep clipped to my belt is my folding knife – a Doug Ritter RSK M1. For me, the knife is my most important survival tool. With it I can make many of the other tools I would need to survive directly from nature. I’m still slowly working on finishing my paracord belt (a new design). Once that is done, I’ll have over 100 feet of usable 550 paracord. Looking at the picture here you can see there are quite a number of articles that can be carried on yourself without effecting your mobility or appearance. All of these items combined comes to just a hair over 5 pounds and most of them are concealed (people only see the bracelet). If people by now are still not convinced that a complete economic collapse is a very real possibility then I don’t know what it’s going to take for them to wake up and prepare themselves. More and more of the mainstream news sources are finally coming on board and indicating a potential collapse as we see with the recent article in the Telegraph (one of the UK’s largest news source): Société Générale tells clients how to prepare for potential ‘global collapse’. 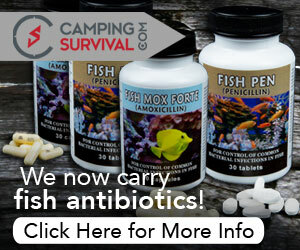 Taking a tip from The Survival Mom, I decided to see about getting some free supplies for my various bug-out bags. There are many resources online where you can get free samples of food, otc medicine, health and hygiene products, and even clothing if you know where to look and have the patience to sign up. Free Beyond Seven Latex Condom – beyond the standard use, condoms make great ‘survival’ water containers. Snuggie – The Blanket with Sleeves – not sure if this one will come, it seemed too good to be true. Most sites require that you sign up for the promotion by giving them your email. Instead of using your own email and getting all the accompanying junk that goes along with submitting it, simply set up a free account used specifically for this purpose. I’ve got one called junkmail75@hotmail.com (feel free to spam me if you like :)). 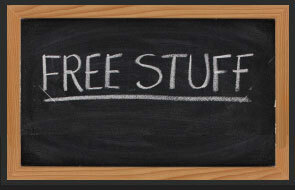 If you’ve got the time or are just sitting in front of the TV with a laptop, why not work on getting some free stuff to add to your stash. Happy hunting! Just a quick update. 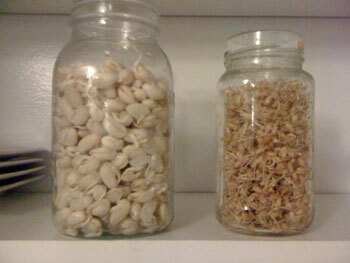 I’ve just added pictures of the sprouting that I did with the wheat and white beans for the Sprouting article I did. 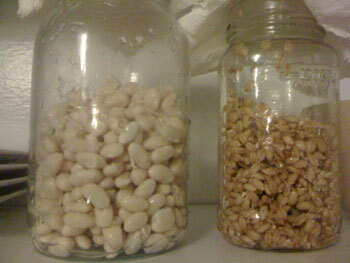 As a side note, it was the first time I tried sprouting white beans. I didn’t really like the taste of the bean sprouts raw but after stir frying them a bit they weren’t too bad. 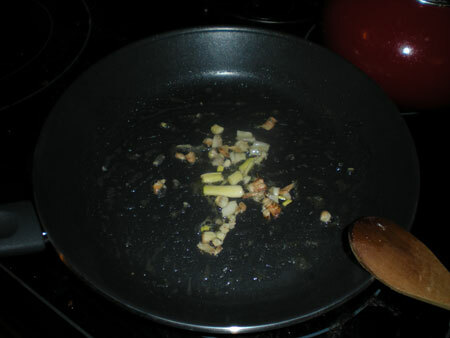 Although I’m not the biggest fan of sprouts by themselves, I do like them on sandwiches, in stir-fry or in omelets. Try them out for yourself and experiment with different recipes (let me know if you find a good one 🙂 ). For those of you that may one day have to live exclusively off of your food storage, have you ever wondered what to do about the lack of fresh vegetables? Well if you’ve taken my advice and stored a year’s supply of grains and legumes, you already have an excellent source of fresh vegetables all year long – in your sprouted seeds! Seeds are nature’s miracles. They contain all the nutrients and energy needed to support a young seedling until it develops its own root system large enough to sustain itself from the sun and soil. For humans the raw seed is an excellent food source, but even more perfect than the seed in its raw form is the sprouted seed. The process of sprouting takes a carbohydrate rich food source and turns it into a “live” food rich in vitamins, minerals, proteins and beneficial enzymes and on top of that is healthier than commercially grown vegetables! 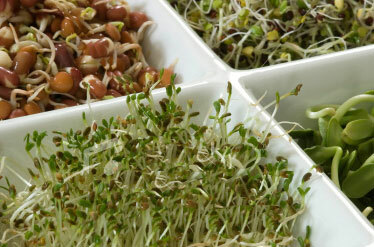 Best of all, growing sprouts doesn’t require any special equipment, soil, or land. With a simple container, 30 seconds of care a day, and some water you can turn your food storage into a vegetable source that is available in all four seasons. CAUTION: Be aware that potato and tomato sprouts are poisonous. Referencing the sprouting chart below, measure out the required amount of seed. Try to use organic, untreated seeds if possible. 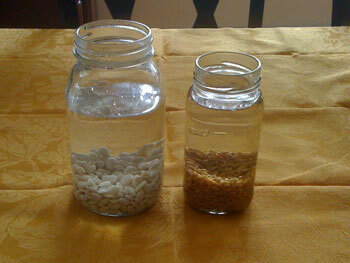 Place the seeds in a jar and completely cover them with warm water until the water is twice the height of the seeds. 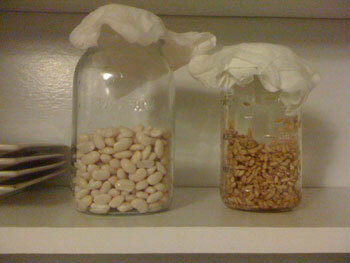 After soaking overnight, drain out the water and rinse the seeds with cold water. Repeat the rinsing every 8 hours or 3 times a day (or as specified in the chart). For greener sprouts expose them to indirect sunlight so they develop chlorophyll. For whiter sprouts, keep them out of the light. Just wanted to quickly point you to this video. Glenn Beck does a good job at laying out the financial mess we’re in and where we are very likely going. Although I don’t agree with him with regards to the banks (Glenn makes it out that the bankers aren’t complicit in this mess and that it’s only the politicians fault) it’s still a great summary of the very likely scenario for hyperinflation, further collapse of the US Dollar and introduction of a new currency. If this doesn’t spurn you on to get out of debt, and get some real assets (such as gold to save your wealth), then nothing will. Thanks Jimmy for keying me in to this vid! During my lunch break at work I will often go out for a walk in some nearby wooded walking trails. It’s during that time that I try to find one wilderness survival skill that I can practice for that hour. This past week I concentrated on fire. You’ll be amazed at the many opportunities you have to practice or think about preparedness scenarios if your mindful of it. Ray Mears videos – If you’re interested in wilderness survival skills and how they are used throughout the world in various primitive cultures then you need to check out Ray Mears videos. 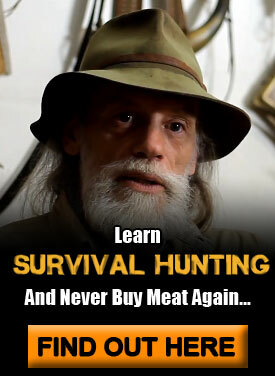 In the same vein as Survivorman, Ray takes you to primitive cultures and shows you skills that they use in everyday survival. Here’s an example video from Youtube. Paladin Press – If you’ve never heard of the publisher Paladin Press, then you’ve got to check them out. While some of the books/videos are a bit out there, they do have some great resources related to survival, personal protections and preparedness topics. 101 Ways to Stretch Your Food Dollars – Some great tips on how to save when buying food. Great for those who don’t think they have any money for food storage. 7 Mistakes of Food Storage – Here’s a great article on what mistakes to avoid when putting together your food storage. This post is sponsored by Prepper Academy, the only preparedness program that shows you step-by-step how to rapidly prepare for the coming hard times — no matter what your income or where you live. This post is a follow-up to the The Fantastic Four – 4 Essential Wild Edible Plants that May Just Save Your Life article. 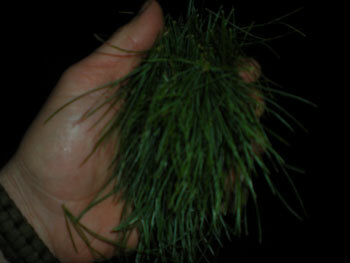 In it I demonstrate how to process and eat one of the core four essential survival plants: Pine. When you look at your average pine tree, rarely does one think that it has the ability to sustain you in a survival situation if the need ever arose. It’s sharp needles and gnarly bark give off the impression that it’s a less-than-friendly flora. 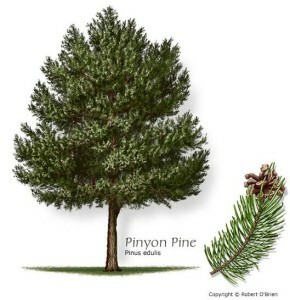 On the contrary, pine provides some of the most readily available food sources in nature. 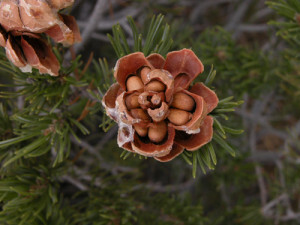 All pines contain edible seeds in the late season cones. The only issue is the quality and size of those seeds are highly dependent upon the species of pine. As someone who lives in the Northeast, species of pine available here do not offer up seeds big enough to warrant the effort required in gathering and processing them. However, if you live in the Great Basin areas where Pinyon pine grows, you have an excellent source of food in the fall time. The best time to gather pine nuts is in September and October. Look for the round open cones. Simply gather the cones, remove the seeds and shell before eating raw or roasting. The needles of all pine make an excellent mild tea (not at all pitchy tasting as you’d expect) that is loaded with Vitamin C.
To make the tea, simply gather a good handful of fresh green pine needles. With a knife or sharp stone, dice the needles as fine as possible. 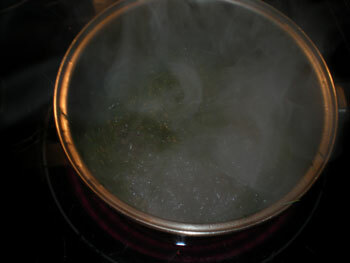 Next, take these needles and put them directly into a cup of boiling water, letting it boil for a minute or two. The water should turn a light yellow color. Add some honey, drink and enjoy! 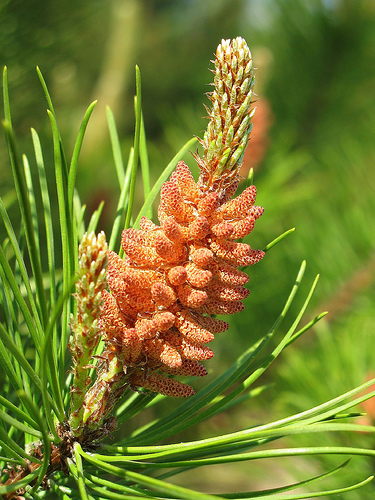 In the spring time, the pollen from the small male pine cones (as pictured below) can easily be shaken from the cone into a container and used as a stew thickener, or flour substitute that is a great source of protein. You can eat bark? Absolutely! When first learning about wild edibles this comes as the biggest surprise to most people. But when I make it for them at home they’re actually amazed at how good it actually tastes. Keep this in mind. When you cut off the bark of any tree be sure never to completely girdle the tree or you will kill it. 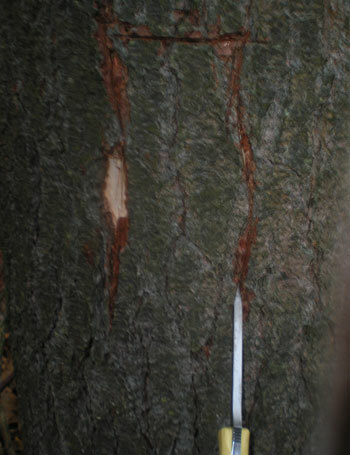 The best option is to cut a small strip at most 1/10th the circumference of the tree. This will allow the tree to easily heal itself. Pine should be plentiful, so a small strip from each tree is more than sufficient to make a survival meal. The first thing you’ll want to do is to choose a large, mature pine tree since it provides the most inner bark without harming the tree. If you have white pine in your area, consider yourself lucky since it’s one of the biggest and tastiest of all the pines. 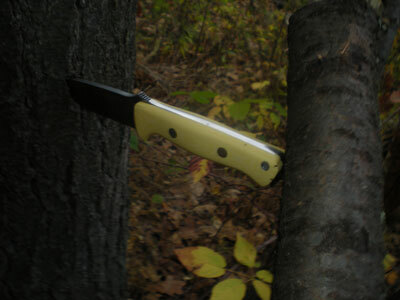 With a heavy duty knife, drive the tip of the knife through the outer bark with a strong stick (this is where a good survival knife comes in handy). 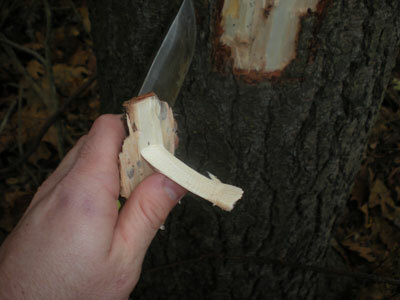 Then begin to pound the back of the blade with a strong stick to drive the edge of the knife down the bark. Continue doing this until you’ve made a decent size rectangle. Peel away the outer bark making sure to peel off the tender cambium layer (the inner bark) that comes with it. 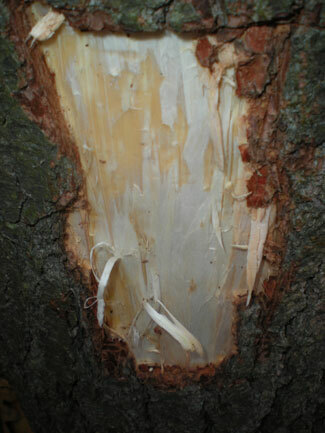 Continue peeling the larger sections of the inner bark. 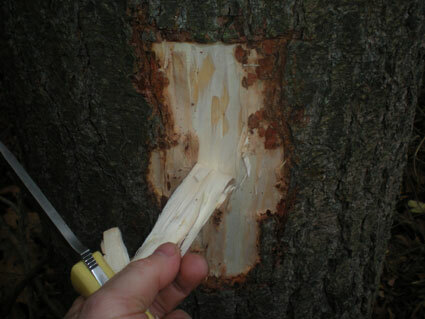 With a knife or other sharp object, scrape away the remaining inner bark stuck to the tree (this is the most tender and sweetest part of the inner bark). I’ll be covering the first two. I find this the least palatable of all the options. 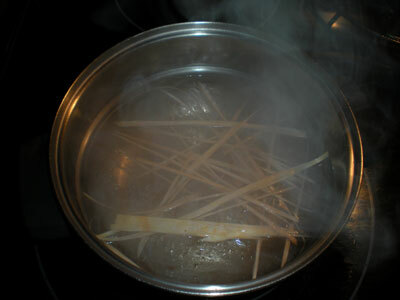 Just peel the inner bark collected from the last step into thin pieces and boil them. The end result is a softer, less chewy version of the raw inner bark. Only slightly better than peeling it off the tree and stuffing it in your mouth. 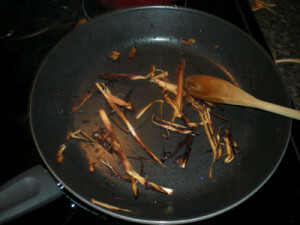 This is by far the best tasting way to prepare pine bark (even my wife likes it :)). 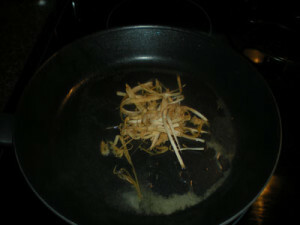 Like in the boiling step, peel the the inner bark into thin strips and simply fry them in some butter or oil until medium brown and crispy. Add a little bit of salt and it tastes like potato chips. This post is a follow-up to the The Fantastic Four – 4 Essential Wild Edible Plants that May Just Save Your Life article. In this post I demonstrate how to process and eat one of the core four essential plants: Cattail. Since I want to demonstrate it to you guys, I can only show you what’s available from the cattail in the fall/winter time (since right now it’s the fall/winter time…duh). I plan on adding to this article in the upcoming seasons to fully complete the food availability of this marvelous plant. 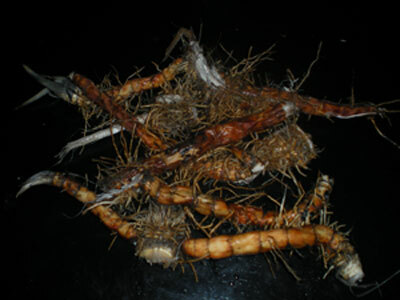 While there are a few other edible parts of the cattail in the fall and winter, the cattail’s best source of food during this time is the nutritious and calorie-dense starch found in the rhizomes (roots) underground. In today’s post I’ll be demonstrating how you collect, process, and consume the nutritious parts of this readily available wild plant. 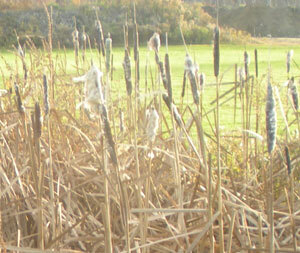 Cattail is found throughout all of North America and much of the western hemisphere worldwide. It prefers to grow in wetland areas but you may as likely find it on the side of the road in a moist ditch. As I mentioned in the Fantastic Four: 4 Plants that can save your life article, it is often referred to as the supermarket of the swamp — and for good reason — as it provides nutritious (and may I add tasty) food through all four seasons. Loosen up and pull out the rhizomes: Now that you’ve identified cattail, it’s time to march out into the muck to pull out the food. 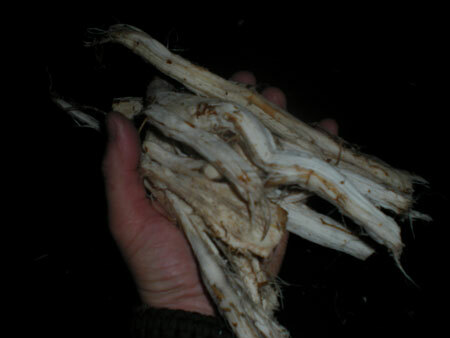 Most of the time you can’t just simply pull at the base of the cattail and out pops out a perfect rhizome. Instead, your best bet is to first loosen up the rhizomes before pulling the plant out. 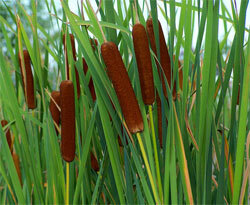 To do this, follow your hand down the stalk of the cattail until you reach the base. Then begin to guide your hand down from the base into the mud until you can feel one of the rhizome branches shooting out to one side. Here’s where you’ll pull and push the rhizome until it loosens up a bit. Do this with the other side and then grab the base of the stalk and puuullll. 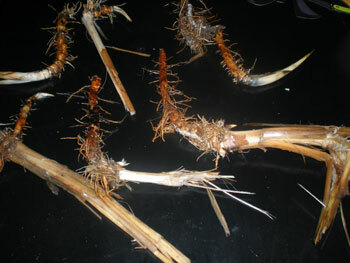 You should be able to pull out a good length of rhizome on each side of the base. Separate the rhizomes from the stalk: his is simply just cutting off the stalk so you’re only left with the rhizomes. 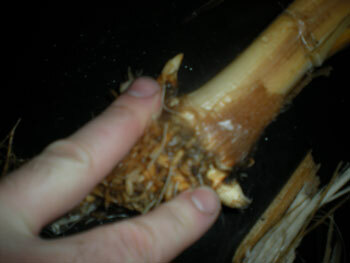 Keep in mind that there are edible corms (the beginnings of next year’s growth) growing on the rhizomes and near the base. You’ll want to make sure to keep these as well since they are a good food source. Clean the rhizomes: After remove the rhizomes, try to clean them as best as possible before bringing them home (or to camp), since they are covered in mud. Most areas where you collect the cattail will have a body of water nearby. Just take the muddy rhizomes and clean them as best as possible in the water (you don’t have to be perfect here). Clean thoroughly: You’ll want to do a thorough cleaning job making sure all the mud is off of the cattails. If the rhizomes look dirty even after the mud is off, it’s alright since they will be peeled in an upcoming step. Looks like giant insect legs huh? 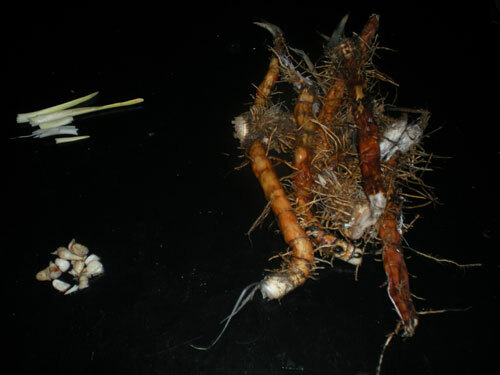 Remove and peel the corms: The corms are the small shoots and stubs that are near the base of the cattail and on the rhizomes. These should be removed and peeled by hand to reveal the tender centers. If you want you can eat these raw at this stage or cook them. Peel the rhizomes: I like to use a sharp knife or a potato peeler. Peel it just like you would a potato to reveal the starchy center. The first and most common way is to break apart the rhizome in a big bowl of water, working it in your hands until the starch is removed. 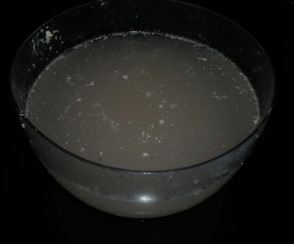 The water will soon turn a milky white and when left to settle for around 3 hours, you’ll be left with the thick saturated starch at the bottom and the light debris floating on the top. After pouring off the water and debris, take the white ‘pasty’ starch and lay it out on a flat surface to dry outside or in your oven (at the lowest temp) or in a dehydrator. The second way (my favorite) is to scrape a sharp rock or a knife along the rhizome in a similar manner to squeezing a toothpaste tube from the bottom up. This will force the starch to be drawn out and it will collect on the knife or rock. You can either take this starch and lay it out to dry or stir it in a container of water so that the small fibrous ‘threads’ from the rhizomes float and separate from the starch. 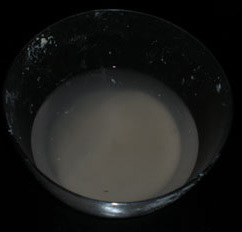 In the same manner as the previous method, after a few hours you can pour the water and debris off and lay out the remaining starch to be dried. 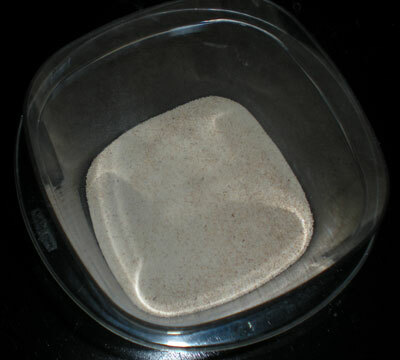 After the starch has dried sufficiently you can now grind it in a mortar and pestle or put it through a wheat grinder to get a finer flour-like consistency. This flour can be used in place of wheat or used in conjunction with wheat and other flours. See one of my favorite recipes below. To make the bread pictured below I used the above ingredients and threw it in a bread machine, set it to ‘basic bread’ mode and voila! 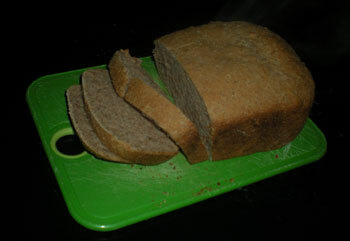 3 hours later I had some great tasting cattail/acorn bread. In a survival/primitive situation it’s a simple matter of taking the dough and throwing it on some hot coals from your fire for ash cakes — also surprisingly tasty!